We know taking care of our bodies is important, but most of us don’t make the connection between our health and our wallets. Stress caused by debt and money worries doesn’t just make you poor in terms of your bank accounts; it also depletes your physical well-being. What’s more, it can have negative impacts on the people living with you, such as your children and spouse. There is a direct connection between physical and fiscal health. Whether you are single and just starting out on your own, or a parent with a household to run, you can almost always strengthen and improve your financial position by doing something now to address the problem. Here are five areas of your life directly affected by financial stress, along with suggestions to help you solve these issues in ways that improve both your physical and fiscal health. Research conducted in 2013 by Kansas State University has found that arguing about money early on in your marriage increases your chances of getting divorced. Fights about money also last longer, involve harsh language and are harder to recover from. In fact, out of all the subjects couples argue about, money is the biggest contributor to separations. One solution: Have money conversations. Everyone has inherited a way they view money which they may not even be aware of, and sometimes those beliefs prove unhelpful. When two people come together to join their lives, they are coming from different socio and economic backgrounds. Problems come up when these differences aren’t talked about. Find out how your partner views money. Is it the root of all evil? Are finances a taboo subject? Does money grow on trees or is there never enough? Examine how you each think about money to shed light on how you handle money. School psychologists and guidance counselors are reporting that since the Great Recession of 2008, more kids are stressed due to the financial tensions at home. This financial stress puts our kids at a greater risk of mental health problems such as anxiety and depression. 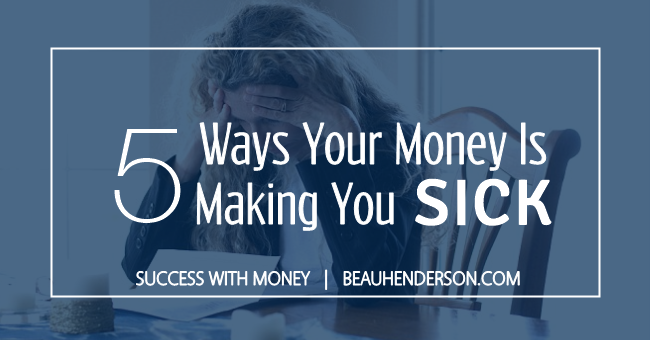 Even if you aren’t talking to your kids about your financial worries, they still pick up on your vibes and notice when your spending habits change. One solution: Teach your kids about money. Instead of keeping them in the dark about money issues, invite them to learn with you. Set them up for a greater chance of success in their adult life by installing good money habits in them now, while they are young. Teach them how to manage their spending by dividing their own money into three portions: an amount to save, spend and share. Choose a percentage amount that makes sense to them and designate three separate banks, jars or containers. As an adult, you might also take a similar approach to your savings goals. A 2009 study by the Associated Press and AOL found that people with high amounts of debt suffer greater amounts of health problems such as migraines, headaches, lower back pain and digestion troubles. People worried about debt are also twice as likely to have a heart attack as compared with those who don’t worry about debt. The solution: Know your numbers. A lot of people are afraid to look at where they stand financially. They think things are so bad, they take the ostrich approach and put their head in the sand. This only feeds the cycle and grows the debt. When you want to lose weight, you have to look at the scale; when you want to lose debt, you have to look at your numbers. Create an income statement and a balance sheet. Identify what’s coming in every month and what’s going out. Get a financial snapshot of where you stand now and then make a plan for how to get to where you want to be. The Filene Research Institute has linked chronic money worries to missed work days, poor performance and even depression. If you are an entrepreneur or self-employed, this stress often compounds because the line between work and personal life is blurred. The solution: Reach out to a financial professional. Once you have talked about money and you know what you need to work on, find an independent advisor in your community. A neutral, third-party professional can review your situation and offer objective, unemotional advice to help you stay on your plan. The fear of running out of money is now known to be the biggest obstacle when planning for a secure retirement. This fear is due in large part to the fact that we are living much longer than we used to, and that comes with an increase in our health care expenses. According to the U.S. Department of Health and Human Services, nearly 70 percent of people turning 65 will need some form of long-term care in the future. This long-term care includes in-home custodial services as well as skilled nursing care. The solution: Be real. If you aren’t prepared, disability and chronic illness can devastate the life savings of even the hardest working person. Talk to your advisor about options for funding a long-term care solution to protect your future. You have to be real to be rich. Like your physical fitness, financial issues must also be tended to frequently and with intention. This is my formula for building a healthy, wealthy and fulfilled life.